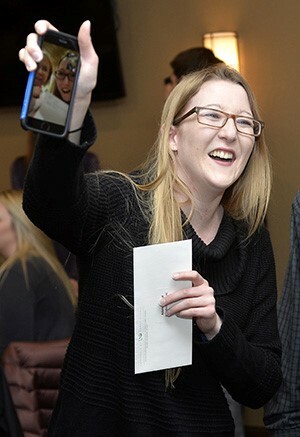 From Bismarck, fourth-year SMHS medical student Kathryn Johnson shares her Match Day results via smartphone with her twin sister Adria, who opened her match letter in Fargo. Match Day for graduating medical students is one of the most important milestones of their careers. Each year on Match Day, medical school seniors across the country find out where they will complete their residency, a period of advanced intensive training in their chosen medical specialty before independent practice as a physician. Depending on the medical specialty, medical school graduates complete anywhere from three to seven years of residency training after medical school. Members of the Doctor of Medicine Class of 2018 at UND’s School of Medicine and Health Sciences (SMHS) opened their Match Day letters Friday, March 16, as well to discover where they will hone their skills as resident physicians. Or, as Mergoum’s colleague Kathryn Johnson put it, in reference to her twin sister Adria, “I would say our Match Day results are awesome! I’m very excited about them.” Kathryn is on her way to a general surgery residency at Hennepin County Medical Center in Minneapolis, while her sister will be going to the Maine Medical Center in Portland, Maine, also to complete a residency in general surgery. While the Johnson sisters are set to begin residencies in general surgery, 17 of the 67 SMHS students matching last week are pursuing family medicine (25.3 percent), which is about triple the national average of graduating medical students entering a family medicine residency. In addition to family medicine, matches for UND medical students in the other primary care specialties include the fields of internal medicine (15), pediatrics (4), and obstetrics/gynecology (3). This makes for a total of 39 of 67 (58.2 percent) of the SMHS Class of 2018 entering primary care. Other specialties chosen by this year’s class include diagnostic radiology, dermatology, neurology, anesthesiology, emergency medicine, psychiatry, orthopedic surgery, ophthalmology, and otolaryngology. The NRMP’s 2018 Main Residency Match was the largest in history, exceeding the more than 43,000 applicants who registered for the 2017 Match and the more than 31,000 positions offered last year. Results of the Main Residency Match are closely watched because they can predict future changes in the physician workforce.